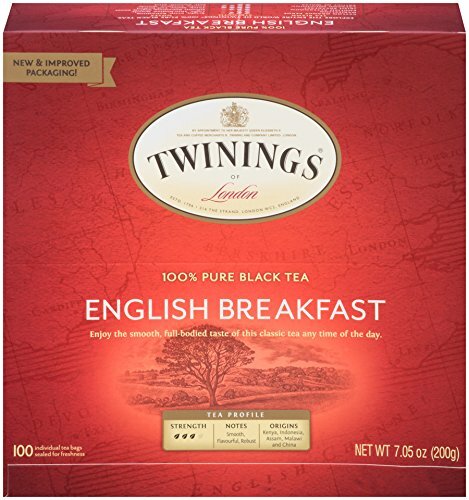 FRESH FLAVOR: One box of 100 English Breakfast Black tea bags. complex, full-bodied, lively cup of tea that is perfect any time of day. Steep for four minutes for the perfect cup of english breakfast tea. ENGLISH BREAKFAST TEA: English Breakfast is our most popular tea. To create this well-balanced blend, we carefully select the finest teas from five different regions, each with its own unique characteristics. RICH HISTORY: In 1706 Thomas Twining began selling fine tea from an English storefront in The Strand, London. Today, Twinings still sells some of the world's best teas from the original store and in more than 100 countries throughout the world. HAND SELECTED FOR YOUR HOME: Made without artificial ingredients, Twinings natural teas provide a wholesome tea experience. If you enjoy Bigelow Tea, Lipton Tea, Harney & Sons Tea, Davidson's Tea, or Prince of Peace Tea - try Twining's of London Tea. A rich & satisfying robust black tea. The robust, malty character of this tea comes from pure Assam and Kenyan tea leaves grown in India. If you have any questions about this product by Twinings, contact us by completing and submitting the form below. If you are looking for a specif part number, please include it with your message.